The Alliance for Children’s Rights, the Step Up Coalition, and a wide range of state and local partners is pleased to share our Resource Family Approval Toolkit. 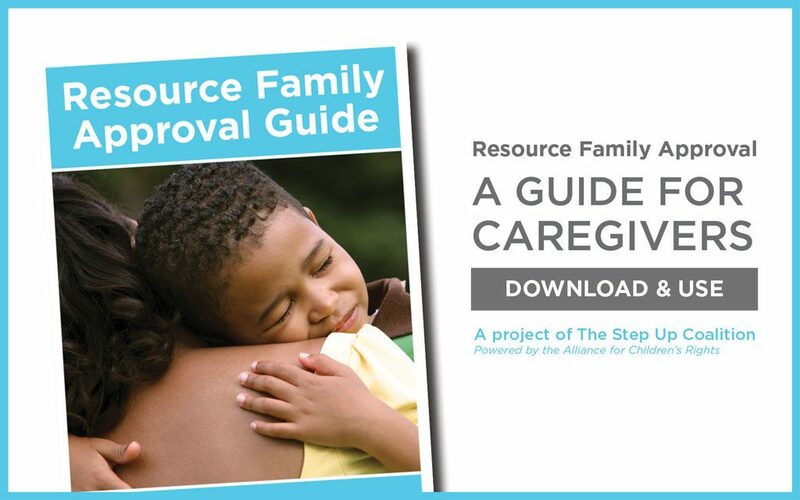 We have designed this toolkit to help walk caregivers through the newly implemented Resource Family Approval process. RFA, which took effect January 1, 2017, creates one uniform approval process for all caregivers in the foster care system, relative and non-relative. It is part of the statewide Continuum of Care Reform intended to ensure that children are raised in family homes and limit the time children spend in institutional group settings. RFA applies to all new caregivers in California, effective immediately. In addition, those who have already been approved and are currently caring for a child in foster care must be reapproved under RFA by December 31, 2020. This toolkit is intended to provide caregivers access to easy-to-understand information, sample forms, and other resources to guide them through the approval process. The toolkit includes a narrative explaining RFA step by step, as well as an appendix full of supplemental tools and other materials referenced in the narrative. It is not meant to be comprehensive; each county in California may have its own supplemental forms and requirements, and all caregivers are encouraged to consult with their social worker and local advocacy organizations for additional guidance. Please feel free to print and distribute the toolkit using the digital master, and customize it with any additional materials unique to your county. The toolkit is designed to be printed one-sided and spiral bound. For more information for those in Los Angeles County, please see the county resources here. Questions? Please contact Shanti Ezrine, s.ezrine@kids-alliance.org.